Presenting another innovation from San Jamar. Most napkin dispensers have a problem, and it’s not just the hassle they create for customers—it’s the money they cost you. Choosing the right napkin dispenser can be a daunting task in itself, let alone worrying about long term costs and waste. Do you need tabletop, countertop, wall-mounted, or in-counter? Or maybe you need all of the above. What type of napkins to you want to use? And will you be able to switch suppliers later without replacing dispensers? The premier Venue line of dispensers from San Jamar is the innovative solution. You get our patented face plates that reduce napkin waste by 30%, versatile dispensing options, and attractive, contemporary styling. 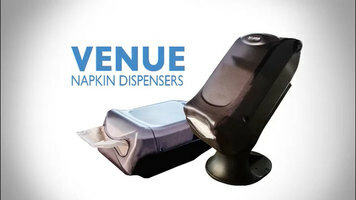 Venue dispensers present the napkin to the customer in a one-at-a-time, easy to use manner. The universal design of all Venue dispensers provides the freedom to choose the napkin you want to use for increased flexibility and savings. The new San Jamar in-counter dispenser offers what your current dispenser doesn’t: versatility. With the optional mounting adapter, you can easily retrofit it into most existing counter openings. The control face provides one-at-a-time dispensing so you save money with every napkin. Interchangeable face plates allow you to dispense full-fold or interfold napkins. The high capacity reduces the number of refills, saving staff time and, like all Venue dispensers, you can use any napkin brand. You can also choose from a variety of other cost-saving dispensing solutions. Limited counter space? Not a problem! Our venue countertop dispensers are stackable, allowing multiple units and more than twice the capacity of other units, in the same footprint. No counter space? Choose the wall-mount Venue dispenser, or the countertop dispenser with a stand minimizes your footprint. Each of our Venue dispensers offers high capacity, so your staff can concentrate on serving customers throughout the dinner rush. Unlike dispensers from paper companies that work best with only their napkins, Venue gives you flexibility. You can switch from full-fold to interfold and back from the supplier of your choice simply by changing out the face plates so you get the same performance without changing dispensers. And, best of all, each venue model delivers smooth, one-at-a-time dispensing down to the last napkin. The Venue line combines stylish, high-end appearance, contemporary colors, and practical functionality, saving you money one napkin at a time. For more information on this and other smart dispensing products, visit sanjamar.com. San Jamar's Venue napkin dispensers offer increased capacity and help reduce waste to save you time and money, one napkin at a time. Check out this short video to learn about the different styles and configurations available in this versatile line. The San Jamar H5005CL fullfold Venue countertop napkin dispenser is a sleek and efficient addition to any snackbar, pizzeria, or concession stand. 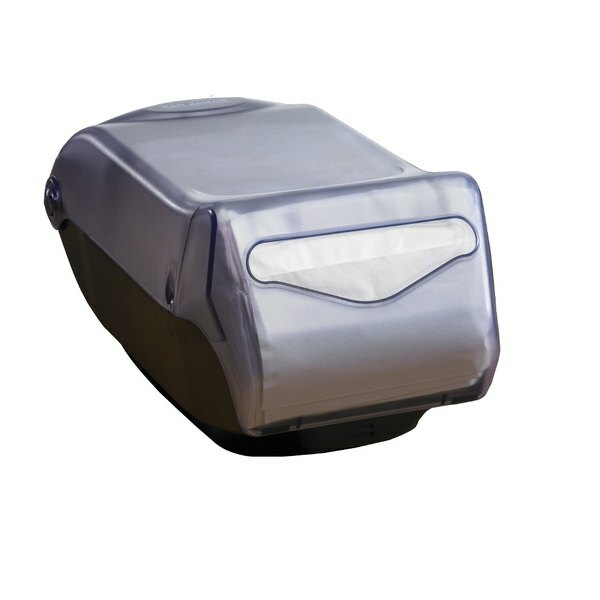 The unique monorail design includes a gravity-feed system that pushes napkins forward as they dispense, preventing customers from taking handfuls at a time, and a built-in overload protection system keeps the dispenser operating smoothly even when overfilled.